If you’re trying to get in shape and lose weight, you’ve probably found that it can be frustrating to find the time to work out consistently. One way to ensure that you’re able to work out when you have some free time is to have a workout space in your home. Whether you want to have a full gym, or just one machine, you can exercise when it’s convenient for you. 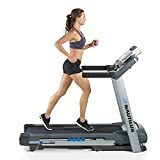 A treadmill can be a good investment for those looking for a workout machine that can be beneficial to people at different fitness levels. Many machines come with programmed workouts that can help those who aren’t used to running. A treadmill is an excellent way to burn calories and increase your endurance. You may wish to use your treadmill to train for an upcoming event. A treadmill can also work well for those who want a less strenuous type of workout that involves walking or jogging. Most treadmills are able to fold when you’re not using them so that you can store them out of the way. Many also have wheels so that you can roll them for storage. The following is a list of the top 10 best treadmills based on consumer report. The Nautilus T614 Treadmill has a large, high-resolution monitor that allows you to easily monitor your progress while working out. 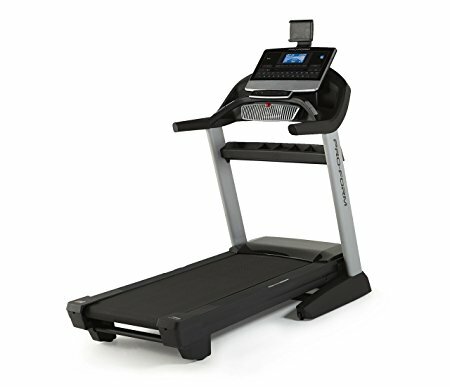 This treadmill comes with a USB port so that you can charge your device or export data using Nautilusconnect.com or myfitnesspal.com. This treadmill has a speed range from 0 to 12 MPH and has a 0-12% incline option. This treadmill from Nautilus comes with 22 programs for different fitness capabilities. It’s able to store profiles for up to 2 people. It has a soft drop system to protect your floors and make it easy to setup when you’re ready to use it. The machine has a maximum weight limit of 300 pounds. 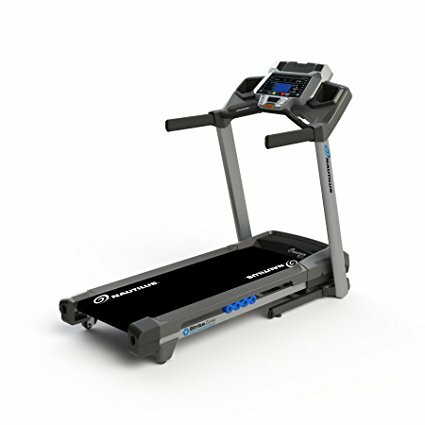 The ProForm Performance 400i treadmill comes with proshox cushioning that is designed to lessen the impact of running on your knees and other joints. This treadmill has a powerful motor that comes with a 25 year warranty. The other parts on the machine have a 1 year warranty for parts and labor. The frame also has a lifetime warranty. This treadmill from ProForm has a port that allows you to play music from your Apple device. It comes equipped with 18 different workouts that are designed for those of varying fitness levels. 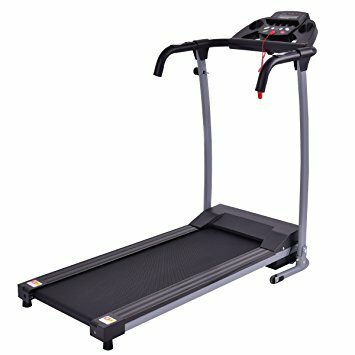 The treadmill has a space saving design and has a 20 X 55 inch belt. The Best Choice foldable treadmill is a budget-friendly option for those who don’t have a lot of storage space for keeping a treadmill. This unit is ideal for apartments and small homes. It folds down for storage when not in use and has wheels so that you can easily move it into a closet or corner when you’re not using it. 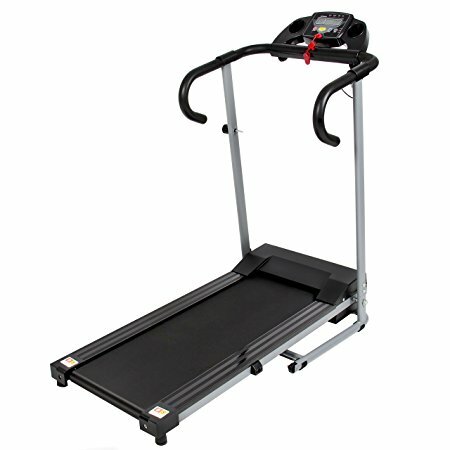 This treadmill has a low noise motor that allows you to use the machine without disturbing others in the home. It comes with a safety stop key to prevent accidents in case you slip or fall while running. The machine has a multi-function display that tracks you speed, distance, and calories burned. The ProForm 505 CST treadmill has a 2.5 chp commercial motor that can stand up to heavy duty usage. This treadmill allows you to quickly control the incline from 0% to 10%. The speed ranges from 0 MPH to 10 MPH and be changed with the quick controls while you’re running. The large LCD window allows you to easily monitor your workout progress. This treadmill from ProForm comes with 18 pre-programmed workouts that are designed to provide you with varying workouts. The heart rate monitor allows you to keep up with your heart rate while you’re running. This treadmill has a 325 pound maximum weight capacity. 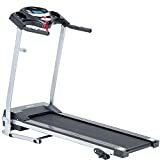 The Merax Easy Assembly Folding Electric Treadmill can fold up and roll for storage when not in use. This compact treadmill works well in rooms where space is limited. It has a multi-functional display that allows you to keep up with your heart rate, speed, distance, and calories burned. This treadmill from Merax has a quiet motor so you can use the machine without disturbing other people in your home. The safety emergency stop key helps to prevent injuries in case you slip while running. The machine has cushioning in the deck that helps reduce the strain on ankles, knees, and hips while running for long distances. The Goplus folding treadmill is very compact and lightweight for use in tight spaces where a large machine won’t fit. 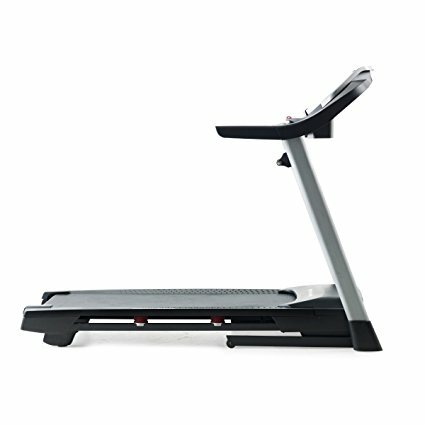 This treadmill is made of heavy duty steel with a solid frame. It is able to support a maximum weight capacity of 220 pounds. The machine can be easily folded and rolled away when you’re not using it to save space. This treadmill has a holder for your mobile device so that you can listen to music as you run. It is equipped with a display that shows your heart rate, speed, distance traveled, time, and calories. It also has a scan function that will show all the different date as you’re running. The ProForm Pro 2000 Treadmill has a 7″ backlit display so you can always monitor your progress while running. The machine is equipped with speakers and a connection for your Apple device so that you can listen and control your favorite music easily while working out. The treadmill has a 3.5 chp commercial motor with a lifetime warranty on the motor and frame. This treadmill has a 350 maximum weight capacity. It has proshox cushioning that helps prevent strain and paint on your joints from consistent running. The speeds can adjusted from 0 to 12 MPH and the incline goes from 0 to 15%. 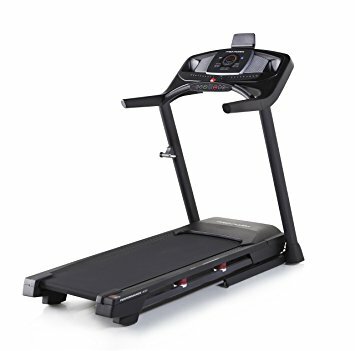 The Goplus folding treadmill has a 2.25 HP motor that is powerful but quiet so that you don’t have to worry about disrupting others when you’re running. This machine has a maximum weight capacity of 220 pounds. It has a an easy folding mechanism that prevents damage to your floors from dropping the unit. The 3 incline levels provide options for different types or workouts. 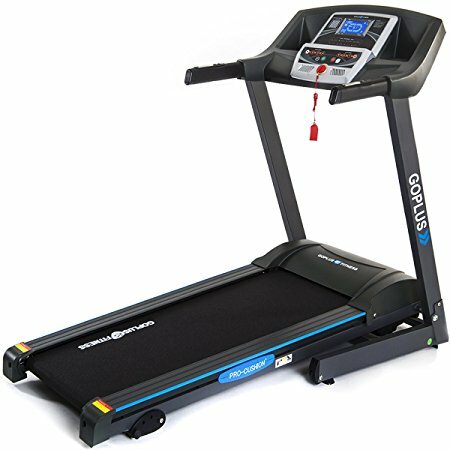 This machine from Goplus has cushioning for a quieter and more comfortable run. It has 12 different programs that are designed to work for everyone from beginners to advanced runners. The unit has a large LCD display and a place to hold your phone while you workout. The Sunny Health & Fitness Treadmill has a 2.20 Peak HP drive system for powerful running capabilities. The machine has a soft drop mechanism and is easy to fold when you need to put it away for storage. It has handrail controls that allow you to control the machine easily without halting your speed. You can also start and stop the machine with the handrail controls. This treadmill has 3 incline levels. The maximum user weight capacity is 220 pounds. It has a pause function that allows you to stop your running progress while still keeping your stats until you’re able to resume your workout. The Weslo Cadence G 5.9 Treadmill has a space saving design. It can fold up easily as needed and has wheels so that you can move it around as needed. This machine has the option of 2 incline levels to provide you with different calorie burning abilities. It also has 6 workouts pre-programmed that were designed by professional trainers. This versatile treadmill works well in small spaces but is capable of providing plenty of power for intense workouts. It has comfortable cushioning to help reduce the strain on knees, ankles, and hips that comes from long-term running. A treadmill can provide you with a variety of workout options in the privacy of your home. You can easily vary the time and intensity to find the workout that benefits you most. When you have a treadmill in your home, you’re able to fit in a workout whenever you have the spare time without having to run to the gym. A treadmill can also save you money over purchasing an expensive gym membership. When shopping for a treadmill, it’s important to consider the amount of space you have. Many treadmills are large and bulky and they require a large space for usage, making them best for those who have a dedicated gym space in their home. Some treadmills are more compact and can fold and be rolled out of the way when you’re not using them. 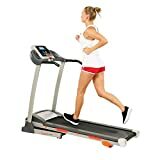 Most importantly, you can read online reviews from others who have used the treadmill to find the best option for the money you wish to spend.